The Morris County driveway pavers are busy once again restoring residential and commercial driveways. Your Roxbury asphalt pavers are being booked quickly. Is your driveway looking tired after the long winter months? Keeping your driveway in top shape is a good idea. Professional pavers can restore your property by repairing or improving your driveway. Are you thinking about redesigning or enhancing your driveway? The asphalt is only one aspect of your driveway. Getting the edging touched up can make a big difference in your property’s appearance. Is it time to put down a fresh coat of driveway sealant? Summer rains are almost as punishing as the snow and salt. Basic driveway repairs will restore the original integrity of your driveway. Taking pictures from previous years helps you gain perspective on the driveways current condition. You can expect that when the work is done your driveway will look as it always has. Repairing your driveway is the most important point. Smooth surfaces are safer to walk and drive on. Loose debris is a potential slipping hazard. Can you get the repairs with a little twist? Are you wishing for a few extra feet of pavement on one side? Your professional pavers can offer many ideas to enhance the functionality of your driveway. Dressing up the edges is always a good way to improve the look of your driveway. Are you thinking more about drainage? Correcting a drainage issue during repairs makes a lot of sense. You can eliminate future complications by improving the design. Commercial driveways get a lot of use all the time. Delivery trucks apply major stress to your asphalt. The slightest compromise in the pavement is going to develop into a rut. Potholes can appear suddenly. Your pavements weakness isn’t always noticeable on the surface. Getting the professional pavers to inspect the condition of your commercial driveway can save you time and money. Is the condition of your parking lot actually driving customers away? Repaving your parking lot before the condition deteriorates is the wiser decision. Business owners understand the importance of first impressions. Is your parking lot giving your customers a favorable impression? Getting your clients into your store is the first priority. Driveways and parking lots display your level of concern for the people you serve. You made the decision to pave and now you have to decide who to call. Professional pavers depend on the endorsements of their customers. Residential and commercial driveways do not speak for themselves. Satisfied customers are responsible for promoting the quality of the work and service they receive. Reading endorsements gives you a clear sense of the trustworthiness of a company. Choosing the right professionals is going to make a big difference in the outcome of your project. Your driveway is an important part of your property. For over thirty five years we have been delivering quality work as one of the leading Roxbury asphalt pavers. You owe it to yourself to give us a call and experience firsthand why our communities love us. Give us a call today at (973) 267-3040 and schedule an appointment. You can leave the worry of restoring your driveway to our team of professionals. We have the equipment and experience to deal with any situation. Our goal is total satisfaction. Delivering beautiful paving work to the families in our community is a pleasure. Why not discover today how quickly and efficiently your driveway can be restored? A smooth asphalt pavement gives all vehicles that come into contact a safe feeling. Knowing that the pavement is asphalt and in good condition puts at ease to the customer knowing that their car will be fine driving through. Also, a good asphalt pavement allows water to drain properly reducing the splash made by the cars driving by. Proper water distribution means less ice during the winter, which results in less opportunity of people slipping and injuring themselves on your property. Asphalt has better sliding resistance from cars and customers. Asphalt pavements are among the most recycled products in the United States today. Asphalt can be reused over and over again to reduce the cost on parking lots and the need for new materials. Asphalt pavements have preventative maintenance, which increases the life of an asphalt parking lot or driveway. Some of the maintenances are sealcoating, which protects the asphalt against water and rays from the sun. If there are any cracks they need to be filled in to prevent potholes and further damage to the asphalt pavement. They keep the asphalt looking like new when there is sweeping and cleaning. Potholes in a parking lot are very common after a harsh winter. Water seeps into cracks in the asphalt and continued to freeze and expand producing even larger potholes. Repairing potholes are very important because it can prevent the asphalt from further weakening and becoming more damaged. Maintenance is crucial if you desire your asphalt pavement to look as good as new. No matter how big or small your business is the asphalt pavement plays a big part in it. The asphalt pavement can be used for driveways or parking lots. It is also used all over the world as a resolution for water storing, erosion and prevention of floods. Maintaining and improving the exterior of your home which includes the asphalt pavement adds value to your home. The homeowner’s responsibility to the home is improving where improvements are needed to prevent damage or deterioration of the property. Asphalt pavement can be quickly installed and requires a small amount of maintenance, which will not disrupt any business from taking place. A home or business with a well-taken care of or newly paved asphalt pavement can tell a great deal about the homeowner and how they take care of their home. Are you searching for a Chatham Asphalt Pavers to work on your new driveway or parking lot? A professional asphalt paver can expedite a job to the client’s request. Whether you are pondering an asphalt driveway for your home or asphalt paving for your business’s parking lot, you can get lasting asphalt with quality and affordable sealer from Asphalt Direct Paving. Sealers protect your asphalt from all items to prolong its life. Asphalt Direct Paving has over 35 years of experience in residential and commercial paving jobs and can provide exactly what you need. For more information or a free estimate, contact them today at 973-267-3040 or visit their website. It is important to do your research in finding the best asphalt paving company. It is wise to prepare and be able to easily determine the right company for your needs. Prepare a list of requirements you feel a professional should attain. Look for a company that can give you a residential or commercial paving service. Read all the information listed about the company and make sure they have testimonials, which are very important. Choose the company that seem the most trustworthy. Once you have the information per company, give them a call and contact them, asking questions about the services they provide, their pricing, their qualification and any other information that you can use to compare with each company listed. This will allow you to make a final choice in picking the company that meets your personal requirements. Your home is likely your biggest investment that you will ever have. A carefully installed or repaired asphalt pavers is extremely important. You do not want an improperly installed paver causing someone to trip and fall on your property. That is why you need an experienced professional asphalt paving company. You also invest a great deal of time and money into your business. Why take a risk with a defective parking lot or driveway. Our professionals will be there to direct you throughout your entire project from start to finish proposing only the highest quality service available. Are you searching for a Chester asphalt pavers to work on your driveway? Asphalt Direct Paving is a reputable company that offers excellence to their customers. We have been over 35 years providing the best asphalt paving services possible, we have experience to handling any paving project whether big or small, we do it all. We are dedicated to achieving the satisfaction of each one of our clients, which is why we always strive to give our clients perfect services. We come and discuss your project in detail at your convenience and make the proper recommendations that fit your individual needs. We develop a plan for your job and provide an estimate. We specialize in all phases of asphalt paving. We provide full service pavings of driveways, parking lots and roadways. We use strictly top quality materials in all our jobs. The best materials have a mixture of strength and durability that is required to enhance your driveway or parking lot. Make sure you contact Asphalt Direct Paving today at 973-267-3040 and schedule your FREE estimate. You will love how your driveway or parking lot looks. If you are ready to look into a Chester Asphalt Pavers job, Asphalt Direct Paving has everything you need. Are you looking outside to where your patio should be? Is your patio suffering the ravages of time? Asphalt Direct Paving has solutions for any Morris County patio paving situation. Springtime and patios just go together. Spending time outdoors is essential to our overall well being. Patios are perfect for enjoying this season. It might be time to add to your outdoor living area or make major modifications. We can transform those plans into reality and get you outside where you belong. Whether you imagine an open area entertainment venue, or an intimate enclave, our staff is eager to see your dreams fulfilled. Why not hire the perfect team to build your perfect patio? Are You Ready for Morris County Patio Paving? How long it takes to finish depends upon when you get started. Let us take care of the details surrounding your project while you plan the celebration. In no time at all you can start hosting friends and family. Our team will work with you to make the transition as painless as possible. The goal is to help you fully realize your expectations as quickly as possible. Sure you can do these things indoors but once you get out on that new patio, you won’t want to leave. Where else can you be grilling, napping or socializing all in the same space? Isn’t this the living space that everyone loves the most? We suppose you can work out there as well. After all, that’s what we do. The flowers in your garden can be enjoyed from the window of your house, but you have to go outside to smell the roses. Patios can accent or augment a garden. They can lend a perspective that can’t be enjoyed any other way. Get up close, pull up a chair, kick back in a hammock and bask in the ambiance. Gazebos and awnings also offer protection from the elements. Build a water garden, or sit down while the spring or summer rain adds even more character to your surroundings. Pools and Jacuzzis are also great for kicking back, day or night while the weathers warm. We love to offer options. Ensuring you are well informed means a lot to us. There are a variety of choices available in outdoor living enhancement. If you have an existing patio that just needs a little something we can help. If you have something far more elaborate in mind we love a good challenge. Never feel rushed into making a decision. Allow yourself the time you need to explore the possibilities. We invite you to visit our webpage to get some ideas. This is a very popular undertaking among homeowners who enjoy sharing pictures of their patio projects. Keep in mind that down the road you might want to enhance that outdoor living space just a little bit more. We’ll still be available to meet those needs as well. Why not make that call right now? You deserve to know just how affordable and rewarding it can be to have a world class location for gathering, just outside your door. Contact Asphalt Direct Paving at 973-267-3040 and leave all of your Morris County Patio Paving needs to the professionals. With over 35 years of experience, you can be confident that you have a winning team. Isn’t it time to pull out all the stops and start enjoying the kind of gatherings that build lasting memories? Take advantage of our ability to transform your patio today. Are you in need of professional Morris County walkway paving? Having a beautiful walkway is an essential part of your homes curb appeal. No one wants a walkway that is severely cracked or has weeds growing through it. It can sometimes be hard to find someone who can provide professional walkway paving at a reasonable price unfortunately. Here are some tips to help you find the right contractor for your job. 1. Word-of-Mouth Recommendation: Getting a good word-of-mouth recommendation from a trusted friend or family member is a good place to start your search. You can trust their word because they have nothing to gain from lying to you about the work provided to them. You’ll also be able to go and take a look at the quality of work provided yourself. 2. Get Several Quotes: Many homeowners make the mistake of just getting one quote and going with it. If you do this, you’ll have no way of knowing if you’re being ripped off or not. Instead, try to get several quotes from a few different contractors and compare them. Many contractors will offer a free estimate and you can use these to find the outliers. This will help you eliminate and cost that seems too high and also the ones that are too low. In general, if pricing is very low, it means that the quality of work provided will also be lower. 3. Communication: Keep track of how well the contractor you’re considering for Morris County walkway paving communicates. Do they respond in a reasonable amount of time. Do they address all of your concerns? If they seem to be evading certain questions that you have, you should be wary of continuing. They may be trying to take advantage of your lack of knowledge to get a few extra bucks from you. Do You Need Professional Morris County Walkway Paving? 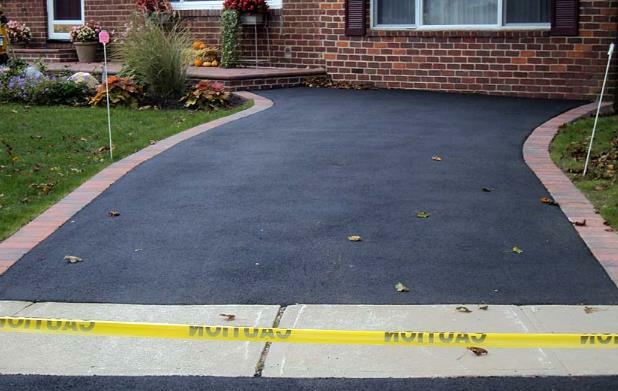 If you’re looking for a trusted professional to provide Morris County walkway paving, look no further than Asphalt Direct Paving. For over two decades they’ve provided New Jersey with exceptional residential and commercial paving. Whether your job is big or small, they’ll handle it with skill and precision. For more information, contact them at (973)267-3040 or visit the website! Are you looking for professional Morris County walkway pavers to work on your walkway? Having a walkway that’s filled with cracks and has weeds growing through it is not a good look. 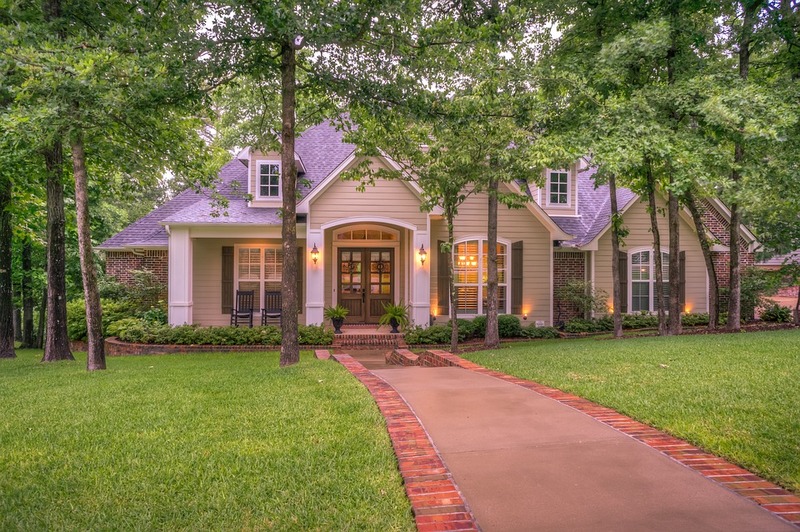 It’s important for the curb appeal of your home that you have a nice walkway leading up to your door. Finding a trustworthy, reliable walkway paver can prove to be difficult though. Here are some tips to help you find the right guys for the job. Communication is a vital aspect of finding the right Morris County walkway pavers. It’s important to make sure that they get back to you in a timely manner and that they fully address your concerns. If a contractor is being vague or trying to wiggle out of a question, it’s usually a sign of something fishy. They may be trying to take advantage of any lack of knowledge you may have. If the communication isn’t good, it may be telling of their services overall. Get a few quotes as you look for the right paving contractors. This will help you eliminate outliers and find a the true price that’s reasonable for your job. It’s important to remember not to just go for the lowest price, because this is usually a tell for the quality of the job they’ll do. Try to get word-of-mouth recommendations from your family or friends. This is the best way to know the truth about a company’s quality of work. Your friends and family wouldn’t lie to you about the services they received so you can trust them. It’s also an opportunity for you to go and personally see the work that they did. Looking for the Best Morris County Walkway Pavers? If you need the best Morris County walkway pavers, contact Asphalt Direct Paving today! They’ve served New Jersey with exceptional work for over two decades and will bring you the best possible services. Whether you need residential or commercial work, a small or big job and everything in between, they can get it done. For more information, contact them today at (973)267-3040 or visit the website! Are you looking to get your driveway paved and you need the best Morris County driveway pavers? Driveways can prove to be pretty costly, especially if they’re not done well and need frequent repairs. To try and reduce cost and stress for yourself, you should have your driveway installed with asphalt rather than concrete. Here are some reasons why it’s the better option for you. Morris County Driveway Pavers – Why is Asphalt Better? 1. It’s less likely to crack or break. Asphalt, while in some ways similar to concrete, is put together a bit differently. Concrete is made with a mixture of crushed rocks, sand, water, and cement. The cement binds it all together and creates a very solid material, concrete, when it dries. Concrete is not good with any kind of uneven surface, however, and is very likely to break due to it. Asphalt, on the other hand, is bound with bitumen and some other components. Hot asphalt is laid on top of a thicker layer of aggregate and once it cools will be very strong and durable as well. The primary difference is that it is more flexible and can handle the stress of an uneven surface. For this reason it is less likely to crack and cause future problems. 2. It’s cheaper to repair. Over time, any type of paved surface will be weathered and damaged by the elements and use. Concrete is much more costly and time consuming to repair than asphalt. To fix concrete, the section that is damage needs to be removed and replaced. 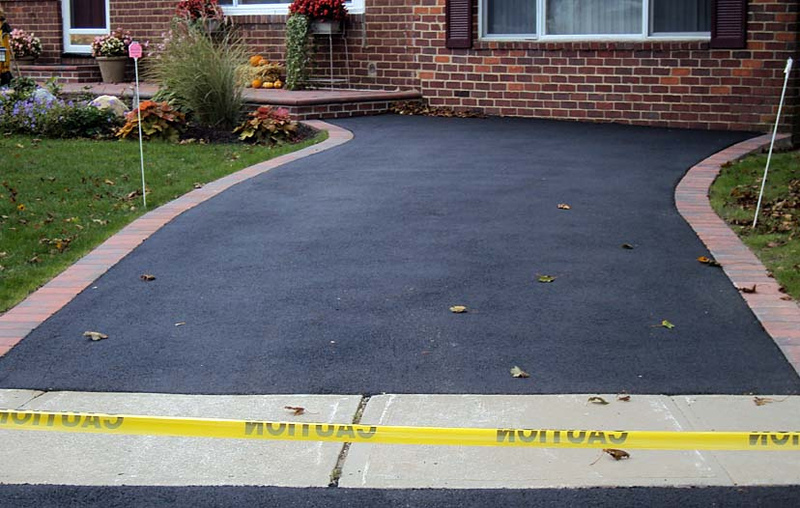 For fixing asphalt, Morris County driveway pavers will simply apply hot asphalt over top of the damaged area. It will seep into and fill the cracks before being rolled over with a steamroller to create a nice, smooth surface. 3. It’s recyclable. This won’t serve you too much while it’s in use, but you can feel good about having a material that won’t take up landfill space when it’s time has come. 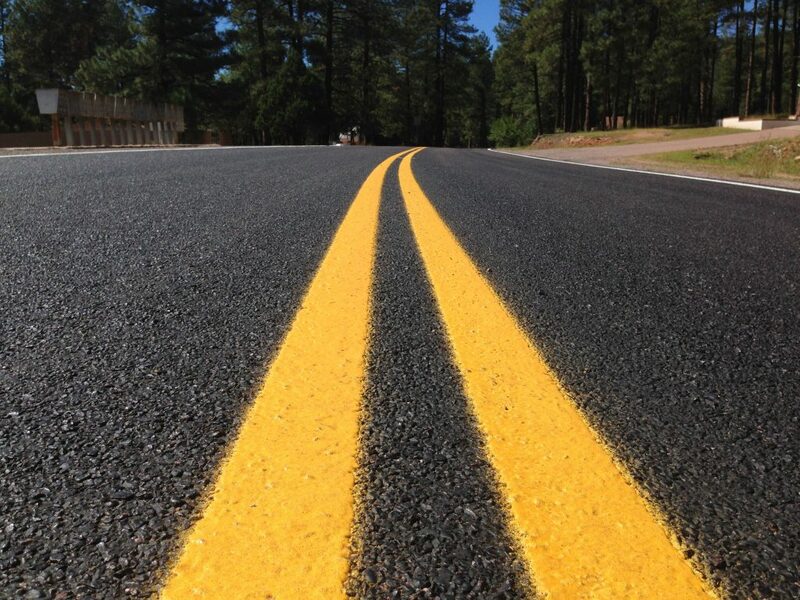 Asphalt is a fully recyclable material that is in high demand. Do You Need the Best Morris County Driveway Pavers? When you get your driveway paved, it’s best to go with asphalt over concrete. Unfortunately even with the best materials being used, if the job isn’t done well you’ll still experience difficulties; that’s why you need to find the best Morris County driveway pavers. Asphalt Direct Paving has over 35 years of experience in residential and commercial paving and can provide exactly what you need. For more information or a free estimate, contact them today at (973)267-3040 or visit the website! 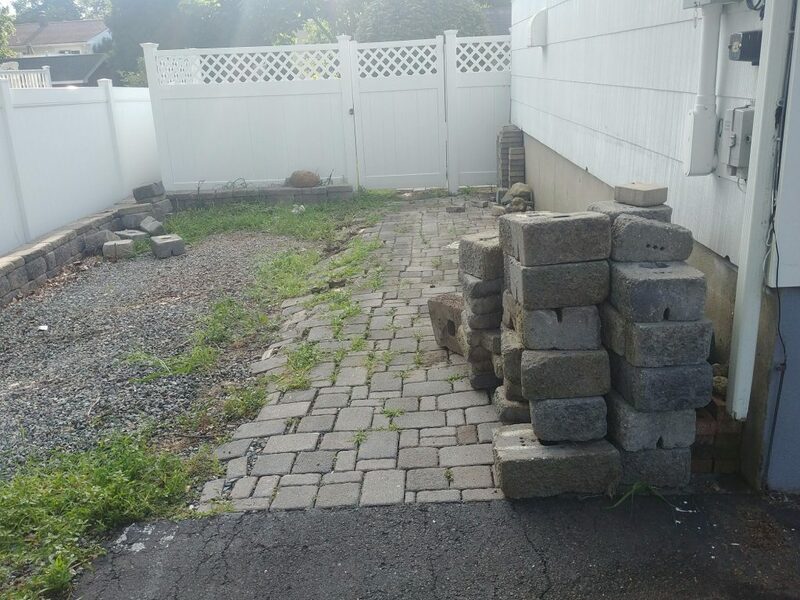 Do you need a driveway or a parking lot paved and you’re looking for the best Morris County blacktop pavers? In years past, concrete was the go-to material to pave roads with. Nowadays we’ve switched to a much better resource: asphalt. There are countless benefits to using asphalt instead of concrete. Here are a few of them. Morris County Blacktop Pavers – Why Asphalt? To really understand why asphalt is the more desired material, you need to know what composes each substance. Concrete is essentially a mixture of crushed rocks, sand, water, and cement which works as the binder for it all. This will all dry and become very solid, but unfortunately also very prone to cracking. This is especially true if the surface underneath the concrete is not perfectly smooth and flat. Asphalt on the other hand is made from a mixture of components itself which is bound with bitumen. Essentially, hot asphalt is poured onto a bed of a heavier mixture and then steamrolled. The asphalt will cool to the air temperature and become quite solid. It will prove to be quite durable, but also able to work with the imperfections of the surface underneath. This makes it much more desirable than concrete which will likely break due to the surface not being perfectly flat. Primarily, the cost of asphalt repair is much lower than that of concrete. It is also less time consuming than concrete would be. This is because of the what is involved with the repair process. To repair concrete, the damaged section needs to be removed and replaced. To repair asphalt, however, your Morris County blacktop pavers can simply pour additional asphalt over the cracks. They will then drive over it with a steamroller again to flatten out the surface with the rest of your blacktop area. This will fill in the cracks and leave you with beautiful, smooth blacktop in a fraction of the time and cost. Are You Looking for the Best Morris County Blacktop Pavers? 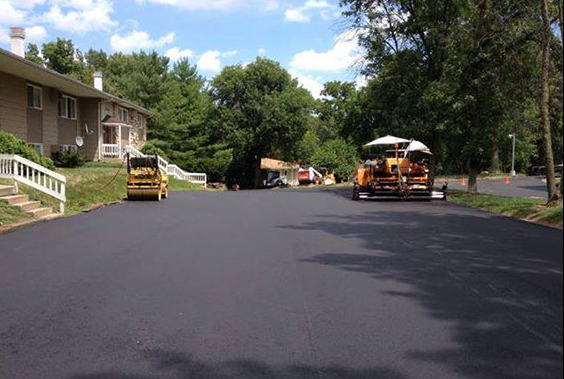 When it comes to having a driveway or parking lot paved, asphalt is the way to go. If you’re looking for the best Morris County blacktop pavers, look into Asphalt Direct Paving. They have over 35 years of experience in residential and commercial blacktop paving. For more information or a free estimate, contact them today at (973)267-3040 or visit the website! If you don’t have a patio, you may wonder what the big deal is. Why do you want Morris County patio paving on your property? A patio provides a little oasis for you and your family and has many advantages. They’re simple to install, look great, add value to your home, and offer a great space for you and your family. A patio can serve a myriad of purposes for everyone at home. Read on for a few reasons why you want to install a patio this year. Sometimes the inside is loud, crazy, and chaotic. You may not have a quiet corner in your house where you can take time to recenter and focus for the day. If we don’t take a few quiet moments to ourselves to reflect, we become frazzled and stressed. Taking time to relax is not a waste. It’s important to help you remain productive throughout the rest of the day, and it saves you a lot of headache. A little peace and quiet improves both your mental and physical health. A patio is a nice outdoor area where you can take a deep breath and shut off your brain. Patios are great to keep your child’s outdoor activities. If you don’t have a large yard, the patio is a nice place to hang out with the kids. You could keep a sand table there, play a little soccer, or bust out the sidewalk chalk and draw if the base is made of asphalt or concrete. It’s a fun place for children and it’s convenient for you to keep an eye on them. It’s close to the house and in the light. Summertime is the best time for a barbecue. A patio is also the best place to keep your barbecue. A firm foundation is needed to put down a grill for your steaks and chicken wings. You could also consider installing a campfire to roast marshmallows for a late night snack. Everyone can gather around for some good food and lively company on a well built patio. A patio is a great place to make food whether for the joy of being outside, or for preparing food when the oven’s on the fritz. 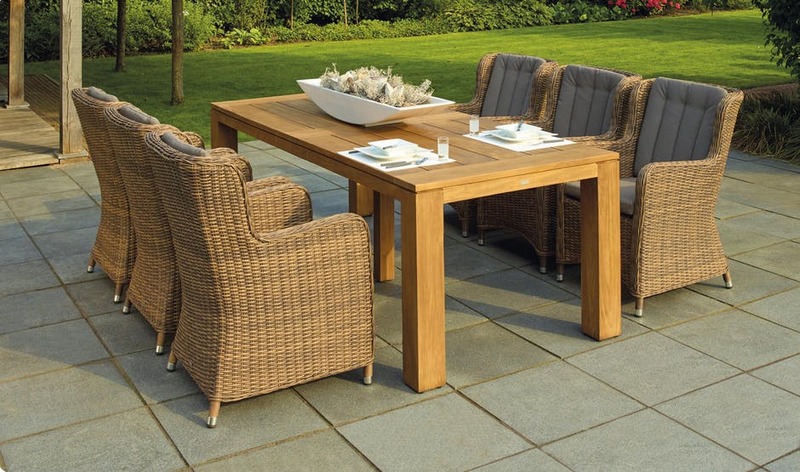 Grab a few chairs and tables on your patio, and enjoy those summer parties. A patio is a great place to enjoy the view of your own back or front yard. When you don’t have a good place to sit and hang out, you may be less motivated to sit outside and enjoy the outdoors. With a patio, you have a great place to kickback and enjoy the view of your own property, or that of your surrounding neighbors. Take some time to observe the world around you from the comfort of your own porch. You may think that installing a patio is too expensive and time consuming, but it doesn’t have to be. When you order Morris County patio paving through Asphalt Direct Paving, you get a free estimate and quality workers. Our company has been building patios for residential homes and professional businesses for over 35 years. Each contractor takes care to build your vision within your budget. We talk with you every step of the way to provide you with the patio you want and need. From the very beginning, you speak to the business owner to ensure a premium patio. For more information on our business and our services, visit our website or call 973-267-3040 today. You’ll be happy you did! If you’re planning on spending a lot of time on your patio this spring, it may need a little work. Maybe you need some Morris County patio paving to spruce it up, or maybe you just need a throw rug and some plants. 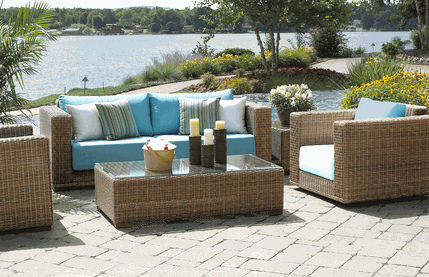 Sometimes a bit of decorating can help your patio become a comfortable place to spend those warm afternoons. If you’d like a place to relax on your patio, grab a few couches and a coffee table. Weatherproof furniture would be best, but you can still bring out the cushy stuff when it’s dry outside. When it comes to furniture, you have a myriad of design options. Choose whatever colors, materials, and as many pieces as you please or have space for. A small coffee table can work well as a foot rest or a place to keep your drinks in the morning. Adding some new furniture makes the outdoors feel a lot more relaxing. You’re more encouraged to go outside when you have a great place to kick back and enjoy the view. A good outdoor rug can tie your outdoor space together. Select the pattern of your liking and place it in the center of your space, or even at the door entrance. This gives you a soft place to walk on, as well as a great cover for the worn down patio. Your patio gets a great look without the costs of repairing scratched up pavement. Whether it’s flower beds around the border or a potted plant on the deck, some extra plants can really brighten up the patio space. They add life and color to the area and can make any rundown space look better. You could get creative and use an old tire, a watering can, or even a boot for a flower pot. Find any container that can hold dirt and get creative with your planting options. You could also plant things for the beauty, or for the practicality. You could try growing a few vegetables for one less item to get from the grocery store. Another option is to plant lemon grass or citronella to ward off mosquitoes in the summer. They’ll keep the bugs away and help your patio smell great in the evening. Did you know you could create a wall out of curtains? If you’d like to separate the space of your patio, consider installing an indoor/outdoor curtain panel. You’d need a space to hang the curtains, but it can give you some privacy in your own yard oasis. Pamper yourself by creating a small cabana on the patio as you watch brightly colored curtains blow in the breeze and give you shade from the sun. Choose any design you like and enjoy that extra privacy. Wind chimes are a nice decorative item to hang over the patio as they can be as big or small as you’d like. They also play a beautiful song on those windy days. A few wind chimes can add that final touch to make your patio a calming space to spend your time in. It ties the whole atmosphere together and gives you a peaceful sound after a hectic day. Close your eyes and listen and when you open them, admire the beautiful and unique design of those decorative chimes you chose. Thinking about installing your own patio paradise? Look to Asphalt Direct Paving for all your Morris County patio paving needs. Our company has specialized in paving for your patios, driveways, and roads for over 35 years. Visit our website or call 973-267-3040 to learn more today.